A State Fossil For S. Carolina Faces Mammoth Obstacle : The Two-Way The state senate is wrangling with amendments to insert language inspired by the book of Genesis into a bill to make the Columbian mammoth the state's fossil. A fossil of a Columbian Mammoth in the Page Museum at the La Brea Tar Pits, Los Angeles. The Columbian mammoth is facing extinction as South Carolina's proposed state fossil unless the elephant-sized Ice Age mammal can survive the efforts of creationist lawmakers. South Carolina is one of only 10 states that doesn't currently have an official state fossil, something an 8-year-old South Carolinian girl suggested the legislature remedy by adopting the Columbian mammoth. 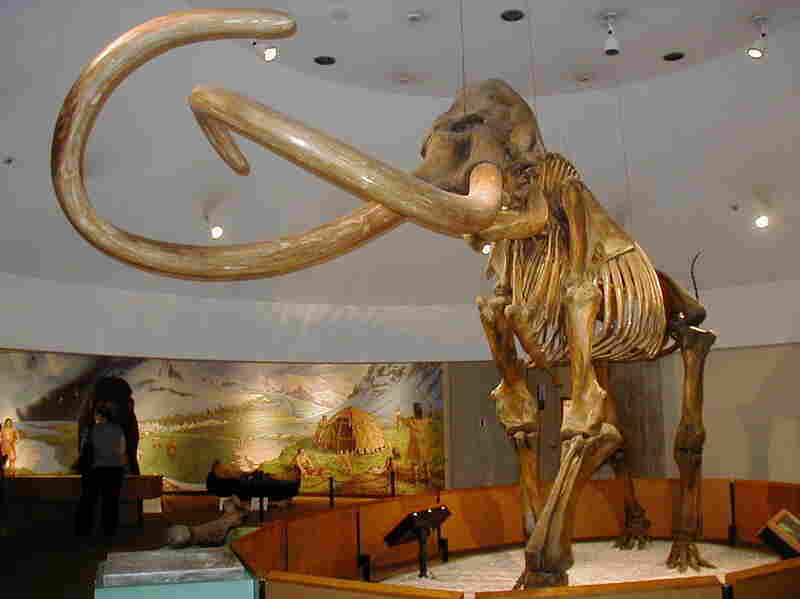 The prehistoric pachyderm is a cousin of the better-known woolly mammoth (already Alaska's state fossil). The girl's rationale was that fossilized teeth of the tusked creature were discovered in a South Carolina swamp as far back as 1725. But as the proposal was being debated last week, Republican state Sen. Kevin Bryant tried unsuccessfully to amend the bill to include a quotation from the book of Genesis about God's creation of the animal kingdom. "I attempted to recognize the creator," Bryant writes on his website. "However, the amendment was ruled out of order." In tossing the amendment, Bryant's fellow senators cited his introduction of "new and independent matter," to the bill. Undaunted, Bryant has rewritten his amendment, proposed language that refers to the mammoth — which paleontologists maintain was the product of millions of years of evolution before disappearing about 12,500 years ago — "as created on the sixth day with the beasts of the field." "I think it's an appropriate time to acknowledge the creator," Bryant tells The Greenville News. "Bryant said he thinks his latest amendment will pass muster as a logical extension of the bill because, "Since we're dealing with the fossil of the woolly mammoth then this amendment would deal with the beginning of the woolly mammoth." "The original version of the bill referred to the woolly mammoth, but it was later changed to honor the Columbian mammoth. "'The courts have upheld using Old Testament scripture because it doesn't point to a single religion,' he said. 'If I used text from the New Testament, if somebody challenged it in court you might lose on those grounds.'" Another South Carolina Republican, Sen. Mike Fair, who initially supported Bryant's amendment, now says he is willing to support the measure with or without the additional language. The newspaper, however, says Fair has made news before "for his views that evolution shouldn't be taught as scientific fact in public schools. "Regardless of how the state fossil controversy turns out, a larger issue over state science standards in public schools remains to be fought, and Fair serves on the state Education Oversight Committee, the panel of educators and lawmakers that will decide it. "The committee has approved new science standards including all of the section on evolution, except on the issue of natural selection, which Fair argues should be taught as theory rather than as scientific fact. He argues that natural selection can make biological changes within species but that it can't explain the whole progression from microbes to humans. "'This whole subject should be taught as a pro and con,' he said."